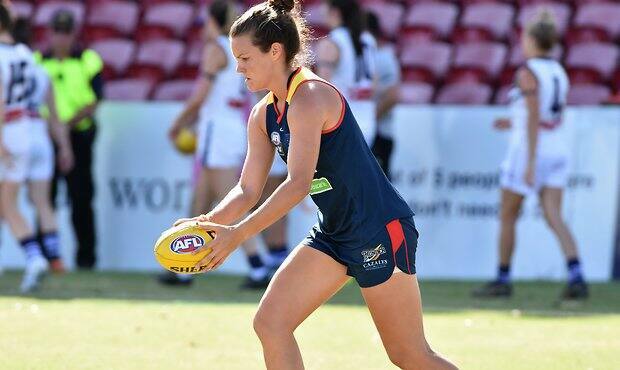 Tash Gunawardana interviewed AFLW player Sally Riley who is the joint vice captain of the Adelaide Crows. 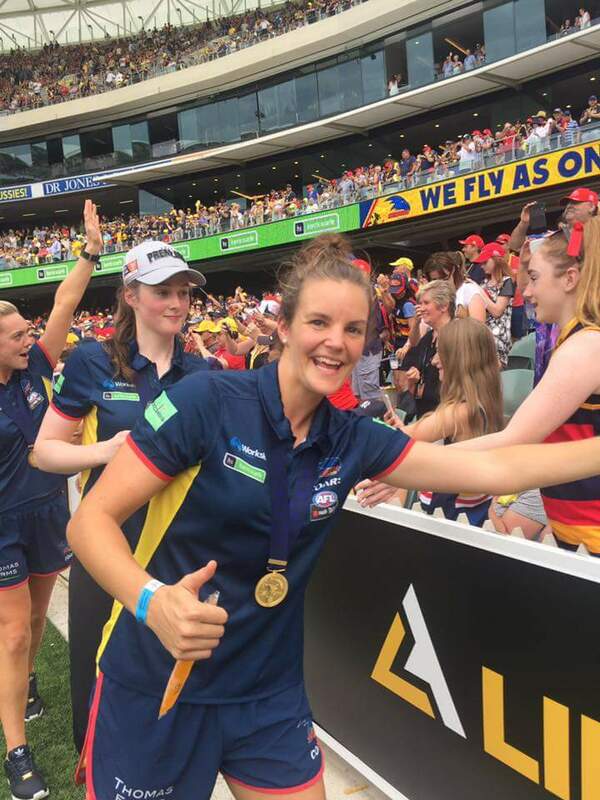 Riley was part of the first AFLW premiership in 2017 and is now a one-time premiership player at the Adelaide Crows. Which AFL player past and/or current do you model your game on? Sam Mitchell and his clean hands, decision making and disposal efficiency as he lacks leg speed similar to myself. Who has influenced your footy and sporting career the most? My parents have been my biggest influence on my sporting career and involvement in sporting teams. To this day they still encourage me to do what I love and to give everything 100%. Football wise Andrew Hodges has been a coach and mentor of mine for a few years now and he has taught me an unbelievable amount. What is your greatest sporting accomplishment? The 2017 season without a doubt. Being drafted, named in the leadership group, playing every game and becoming a premiership player is pretty hard to beat! Being outdoors and around friends. I enjoy going camping or doing road trips and activities when time permits. I also love going out for breakfast. What do you enjoy most about playing women’s footy? I love that footy is a team sport. It makes all the preseason training, Christmas day training and tough choices easier knowing that you are doing it to benefit the team. There is nothing better than going through the highs and the lows with a quality group of people. Would you ever consider being traded to a Melbourne based AFLW team so you can play in your home state? I would never ask to be traded to another club as the Adelaide Crows is the perfect fit for me and I love the culture and vibe that we have created. They are my family away from Victoria. I am a very loyal person and when I love my team as much as I do right now, I am Adelaide Crows through and through. In saying that though, when my time is up with the Crows (which I will be very sad when this day does come) and if Melbourne clubs are interested then I might consider a move if I felt I had more playing years left in me and a club was a good fit. What is your pre-game and post-game routine? Pre-game I am normally pretty relaxed and just do my own thing. I eat a big breakfast and depending on when game time is I will have a light meal and/or a snack a few hours before playing. Once at the ground, I do a lot of stretching and mobility and try to touch the ball as much as possible. A weird pre-game superstition is as soon as I put my boots on I put my mouth guard in my left sock so I don’t forget it when we run out. Post-game the recovery routine to prepare for the following week starts straight away after the coaches’ address. Protein shake, ice bath, showers, food and an early night. What is the best thing about being the joint Vice Captain of the Adelaide Crows? It was an absolute honour to be named joint Vice Captain in 2017 and something I was not expecting. The best thing about this was being able to work closely with the other leaders each week and playing a part in setting up the culture and team standards that we wanted to be known for as a playing group. Working closely with Erin, Chelsea, Ange and the coaches also meant I learnt a lot quicker and it also fueled my desire to want to keep improving my day-to-day leadership as a player, work colleague, friend and teacher. How did you feel to play in the first AFLW grand final for the Adelaide Crows and then to actually be the first AFLW premiers? It’s very hard to describe the feeling of playing in the first AFLW GF as it was a mixture of excitement, nervousness and adrenaline yet the whole day went so fast it is actually all a bit of a blur. We knew that this opportunity doesn’t come around every day and that the way the competition was structured ourselves and the Brisbane Lions were very privileged to be playing in the Grand Final after just 7 games of football. Personally I wasn’t able to contribute to the win on the day as much as I would have liked but that feeling and emotion when the siren went and we realized what we had done was unbelievable! Never been so happy! (although draft day was pretty close!!). To be honest though I do feel like a bit of a fraud to have an AFL Premiership medal in my possession after only playing 8 games of AFL football when the men play 15 years and may never win one. But at the end of the day, someone had to win and become the new owners of the cup and those medals so I am very grateful it was our team and would not change a thing! Do you feel the Adelaide Crows could go back to back in 2018? Absolutely! Why can’t we?! Our squad has only got stronger and there is certainly no complacency amongst the group as we know to win it this year we must improve. Season 2 is a whole new ball game so bring it on I say!